Glenn writes, “They have other route numbers available too, including Route 66 and US 1, but Susan rejected them because ‘Everybody does Route 66’ and the US 1 sign said ‘Historic’ instead of replicating the actual sign. The Learning Community is an Oregon-based organization offering free resources to help parents and families. www.thelearningcommunity.us/. We have no connection to either: we were merely a paying customer, and the ornament is really cool! I wouldn’t recommend an inferior item just to help a non-profit, nor recommend an item that helps a for-profit business, but this one is win-win. 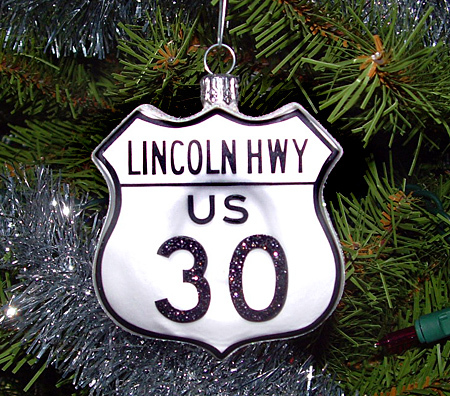 This entry was posted on December 2, 2009 at 2:24 pm and is filed under highways, history, Lincoln Highway, signs, souvenirs. You can follow any responses to this entry through the RSS 2.0 feed. You can leave a response, or trackback from your own site. That’s pretty cool! I may just have to add it to my collection! Thanks for mentioning our ornament and our mission of helping families. We appreciate the help of fans like you! cool stuff, leave it to Glenn Wells (& wife Susan) to find this.